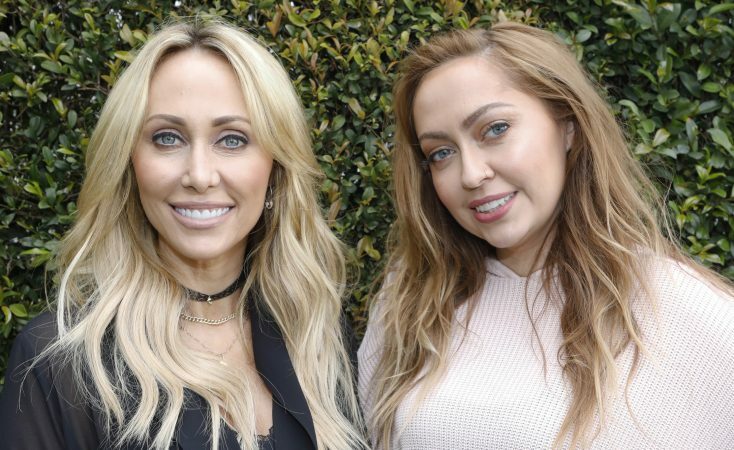 HOLLYWOOD—Momager Tish Cyrus and her deejay daughter Brandi Cyrus are set to star in their own reality series “Cyrus vs. Cyrus: Design and Conquer,” A six-episode series set to premiere on Bravo May 25, 10:15 p.m./9:15c. Tish, 57, explained that she was pursued for years to star in a reality series but she was too busy managing the career of her other daughter, pop sensation Miley Cyrus. Bravo was different, the lithe blond explained. Executives at the cable network gave her leeway in deciding what kind of reality show she could have and agreed to work around her schedule. Interior design always has been one of Tish’s passions. The return of 29-year-old Brandi to the Tennesee roost only made the project more tempting for the dynamic businesswoman. She and Brandi, a musician and professional deejay, assist six Nashville area homeowners with design projects. Although they are not central to the series, other Cyrus family members—Miley, Billy Ray and Noah, Braison and Trace—appear sporadically throughout the six-episode arc. The Cyruses, both extraverts and obviously close, spoke at a preview event about their upcoming cable series and despite their gift of gab, didn’t reveal too many spoilers. Q: Can you talk a little bit about the show and how you got involved in it? Brandi: The show is a home design show and we start with six episodes. Each episode is a different house and, basically, we go in and there’s one or two rooms or spaces in the house that the homeowner wants to renovate. We listen to what they want, what they need out of the space, and then we go back and individually come up with two individual designs that we end up taking back and we pitch these designs to the homeowner and in front of each other. Then, once the homeowner has heard both pitches, he or she has about 10 minutes to decide whose they want to pick. It starts out as a bit of a competition and we’re very competitive in the beginning. Then, once the homeowner picks someone’s design to go with, we work as a team to execute it and make it all happen. Q: Are you working under time constraints? Do you have a week or whatever to complete the redesign? Tish: Yeah, that’s one of the most amazing things for me, is to see how quickly we have to put these things together, because there are some major time constraints. Between that and budget, it really is a challenge to see your vision come to life. Brandi: What’s great is when we go into a home and meet the owners, we know their budget upfront. It’s kind of our job to come up with the plan that we know we can do for them within their budget, so that we’re not making promises we can’t keep. If you’ve done construction and design you know that along the way, things always happen and go wrong that are going to cost more than you think, so it’s up to us to allow for that so there aren’t any disappointments. Brandi: Yeah, but that’s some of the conflict that makes the show fun and really entertaining. We tell them “Well, if you want this, then you have to sacrifice this.” Or, “Let me go back and see how we can make this work.” That’s something that makes the show really entertaining and have that tension. Q: What’s in the water in Tennessee? Why do you think the family turned out as creative as it did? Tish: Gosh, I don’t know. Brandi: I credit so much of our success to my mom and dad being so supportive, so encouraging. Of course, they’re parents but they’re also our friends at the end of the day. We’ve never been told who to be and who not to be. Any dream you’ve ever had, they say, “Go for it” and they’re supportive and they do what they can to help. Not everybody gets that, and I realize how blessed I am to have such a great family. That’s why we’ve all been able to be so successful and do what we love, because that’s what we were encouraged to do our whole lives. Tish: Yeah, the biggest thing for me is I’ve had so many different offers for different docu-series or talk shows based around our family or just about following me, and it’s just something I was never interested in because I feel like my family is so talented and they are so passionate about their art and their music and all those things that it was just never a consideration. It was never like I just wanted to be on a TV show. When this came about and it was about interior design, that’s kind of been my passion. Theirs was music and TV and all their art, but I would say to them, “This is my art. Come look at this room I’ve done and this wallpaper I’ve created.” They all truly knew how much I love doing interior design. Bravo was so great about saying, “This does not involve your family; this is a design show.” So I was like, “Really?” I was really skeptical. There’s no way they’re not going to want that. They were like, “Actually, no.” It was so funny, because within these six episodes, somehow each one of the Cyrus members made its way into this show. If we would have tried to plan that nobody would have wanted to. Brandi: We worked so hard to keep everybody out of the deal, like you’re not getting anybody but just the two of us, and then everybody ended up wanting to be a part of it. Q: How did they organically become part of this show? Brandi: We don’t want to give too much away. It just worked out where everybody stopped by and then Miley came to town to visit and was like, “I want to come home more because my entire family is back here. I want to be with my brother and sisters and mom. Can we do something where I get a place and you do it for your show?” I’m like, “When am I going to have time to do that?” She’s like, “Well let’s do it for the show.” People probably won’t believe that but, honestly, we never intended for the family to be any part. It truly just happened. Q : What does Billy Ray contribute? Tish: My husband does not have a design bone in his body. He just doesn’t get it. He can just hang a lot of Native American artifacts everywhere. Brandi: But in some way that’s art. Tish: Maybe in a way. Brandi’s very creative because she plays guitar, but she loves fashion and interior design. I’m not a singer in any way but I do have an ear for music and I’ve produced film. So I think if you are creative, you think with that side of the brain. Brandi: Yeah, left brain and right brain, I think that all fits in. A lot of the same tastes I had in fashion translate over to my home design style, and this industry does overlap. When I was in a band and I was playing music, they still cared about what I wore and how I looked because that’s part of it. It all really does overlap and becomes almost one thing. Q: Since you’re based in Nashville, is the show pretty much situated there, or do you go outside the region? Tish: It’s all set in Nashville. Brandi: We do go all around the city and there’s some that are in a suburb. There’s one house that’s downtown and one on the north side of the city, so you will get to see a lot of different styles in Nashville which I think is really neat, and because Nashville is diverse. You can live downtown in a high rise or you can live 30 minutes out and have 10 acres of property with horses. People are going to get to see all those different aspects of the city. Q: Do these families have big personalities and are they at war with each other? Brandi: Every single home had a completely different dynamic. Whether it was a couple or a mom and son or an entire family, every single one was so unique and different, and it was really cool because we got to do such different projects for each. Some of them are friends of ours. One of the homeowners you’ll see has been a friend of mine for 12 years. Then some of these people were friends of friends and word-of-mouth clients. Nashville is such a small community and everyone knows each other and that’s something I love about it. You kind of get to see that happen. Some of these people that we didn’t know so well at the beginning all have become friends and family to us. It was such a great experience. Q: Who won the most pitches? Tish: We can’t say. We can’t tell you. You’ve got to watch. Q: How are you guys as a team? Do you work well together? Brandi: We do. We actually do. Tish: It started out being much more of a competition then it ended up. I was glad because even though I want to win, she’s my daughter so I want her to win, too. Vice versa, she wouldn’t have wanted to win them all, but what was cool is for the person that did win, there was always something in the other person’s design that the client wanted to do. It ended up coming together where it was both of our styles, which were so perfect when they meshed together.